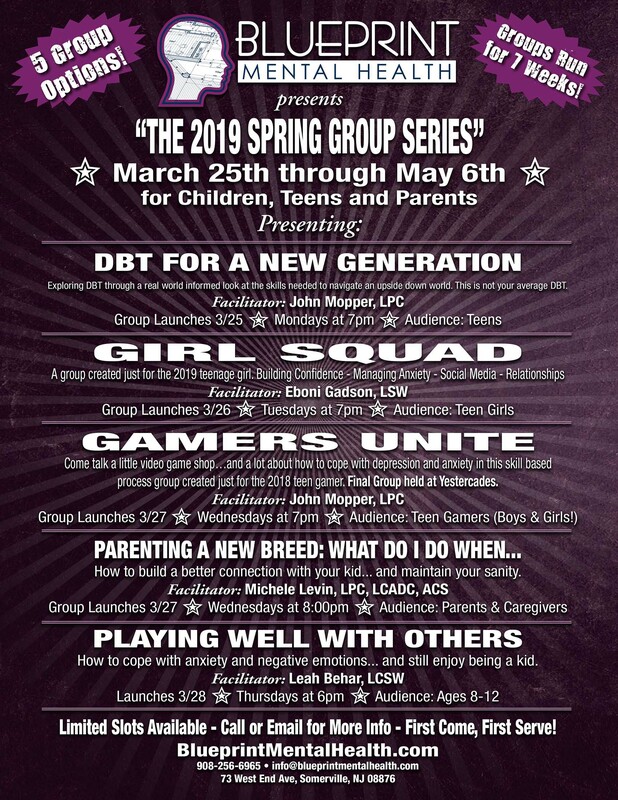 Blueprint is excited to announce our 2019 Spring Group Series. Blueprint Mental Health is excited to announce the launch of our 2019 Spring Group Series! This time around, we have a choice of 5 different groups and have added Gamers UNITE to the roster. Group counseling is a great addition to individual counseling or can be cool all by itself. Come meet some other people in similar situations as you, practice some skills and maybe have a little fun. Don’t procrastinate though…registration is on a first come, first serve basis and groups tend to fill up. A group created just for the 2018 teenage girl. Come talk a little video game shop…and a lot about how to cope with depression and anxiety in this skill based process group created just for the 2018 teen gamer. Blueprint offers a wide variety of outpatient groups for children, teens, young adults, and parents. Groups are a great addition to individual therapy and also a great way to improve social skills. Give us a call to find out what groups are currently available.